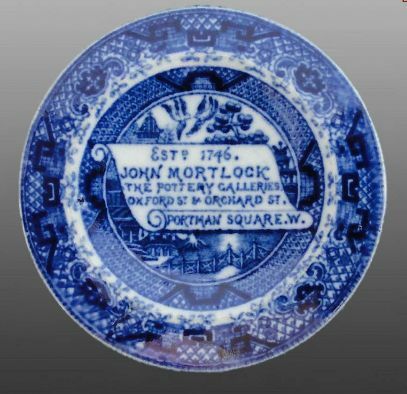 This story starts with a bit of family history, which is quite a complicated one since most of the family members working in the Mortlock china business were either called William or John. (1) The firm of Mortlock & Sturges had started as plain Mortlock in 1746 by John Mortlock I (1698-1758), whose son William I (1747-1807) took over at some point. He worked with his two sons, William II (1778-1833) and John II (1776-1837), who took over when William retired. 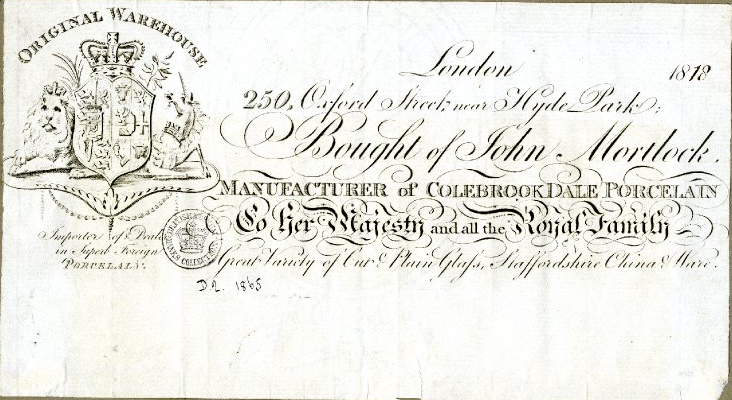 In 1809, the brothers dissolved their partnership with John to continue the Oxford Street business. (2) William set up independently at 18 Regent Street. So far so good, but this is where it gets complicated as William II’s son William III (1801-1879) went to work for a number of years at his uncle John’s in Oxford Street. William II’s other sons John III (1808-1888) and Frederick helped out in the Regent Street business. In 1828, William III left working for his uncle and partnered with his brother John III at Regent Street. (3) A few years later, however, uncle John II of Oxford Street retired and John III left his brother to take over the business in Oxford Street, together with his cousin (several times removed) Simon Sturges, hence the name ‘Mortlock & Sturges’ in Tallis. (4) The partnership between the cousins was dissolved in 1841, and the Oxford Street firm was continued by John III on his own until his son John George (1835-1917) joined him in 1861. (5) Still there? Right, on to the china business itself. By 1800 the Mortlocks claimed that the porcelain they produced was “superior to any porcelane [sic] ever manufactured in this kingdom, particularly for its durability and elegance of finishing”. (6) They also sold china from other manufacturers and glass ware. In fact, it is debatable how much they actually produced themselves. They are known to have bought in huge supplies of white porcelain which they decorated and fired to their own designs, for instance from Nantgawr. 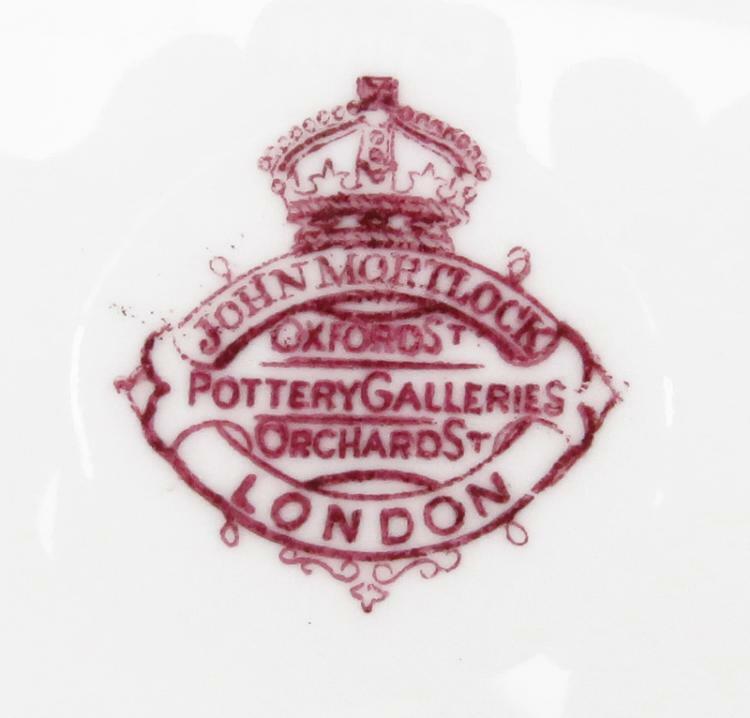 (7) We also know the names of some of Mortlock’s customers, as an 1805 invoice in the collection of the British Museum, for instance, names Colonel Ribou who bought a pickle set, wine glasses, scallop shells, decanters, and coffee cans, but you could apparently also borrow items you only needed for a particular occasion. On the invoice are entries for two dozen blue and white plates, six soup plates of which two were returned broken, and a month later again 12 blue and white plates, 6 soup plates and 12 smaller plates “lent”, this time no breakage was reported. Borrowing a dozen plates cost one shilling. Mortlock had Royal patronage and supplied various aristocrats with china, as, for instance, to George, 3rd Earl of Egremont at Petworth House. (8) And more substantial items, such as pedestals and jardinières, were supplied to William, 5th Duke of Portland. 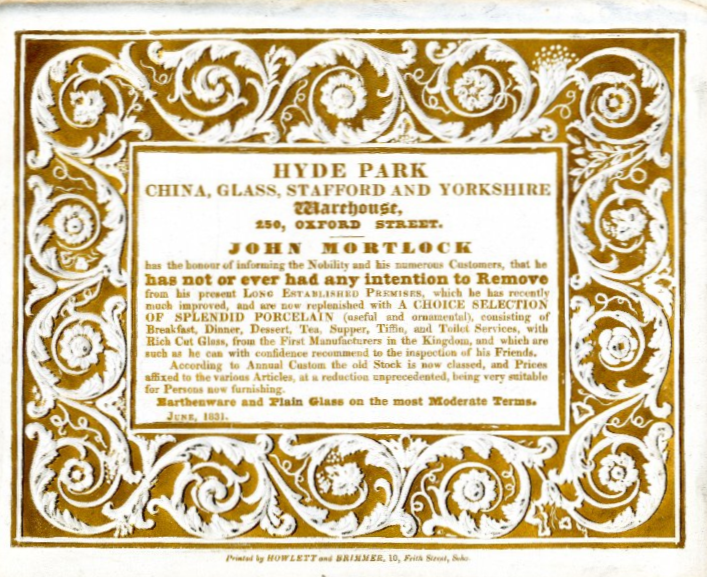 (9) In 1854, Mortlock repeatedly advertised in The Examiner, specifically with flower pots and garden seats in various colours “at the lowest possible price, for cash”. And in 1874, they advertised in The Gardeners’ Chronicle with dairy utensils in white or brown ware “at wholesale prices”. In 1831, around the time when William II started out on his own in Regent Street, John II though it necessary to acquaint his clients that, despite rumours to the contrary, he was not moving and he even said so on a trade card, which is dated June 1831.
trade card (© Trustees of the British Museum) The museum gives the card a date of 1813 in the right-hand bottom corner, but that cannot be right as the only time there were two Williams and one John running the business was when William I and his two sons were in partnership, but William I died in 1807, so the card must be dated earlier. 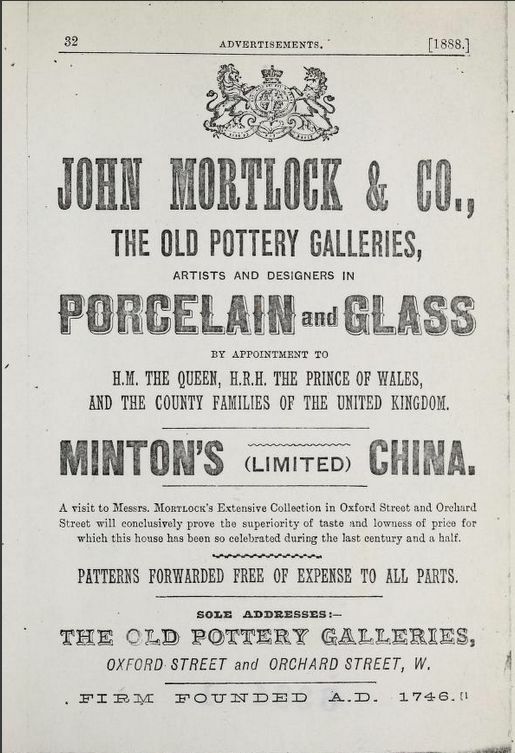 In 1861, Mortlock entered an advertisement in The Sunday Times in which he announced that he was selling off his stock as the Marquis of Westminster did not want to renew the lease on his premises at 250 Oxford Street and 58 Park Street (just around the corner from the Oxford Street shop). (10) He sounds quite peeved about it. It took a while to get rid of the stock as similar advertisements appeared in the newspapers till at least May 1862. For a while after that, the advertisements just give the address as Oxford Street without specifying a number, but design registrations from 1868 onwards give number 204 as the new address, which was across from the old shop. It did not take long for the business to spread itself to neighbouring properties; first 203 Oxford Street was added and then 31 and 32 Orchard Street around the corner. In 1881, Oxford Street was renumbered in such a way that the residents of some properties objected. Not only were they forced to spend thousands of pounds on new shop lettering and business stationary, there were also duplicate numbers. Brown, Gould & Co. who had offices at 470 and 520 Oxford Street, complained that the duplicate numbers were causing confusion and they gave Mortlock’s, on the opposite end of the street, as an example since they had also been given the new number 470, and Brown’s other premises (at number 520) had the same number as James Pile & Co, tailors. Brown had enquired at the Metropolitan Board of Works whether the eastern end of Oxford Street, that is, the section east of Tottenham Court Road, was to be renumbered as well to solve the confusion, but they had been told that that was not planned. I am not too sure whether there really was a problem as the eastern section was and is named New Oxford Street, which should avoid confusion, but apparently the ‘New’ part of the name was often excluded from the address causing non-delivery of letters. 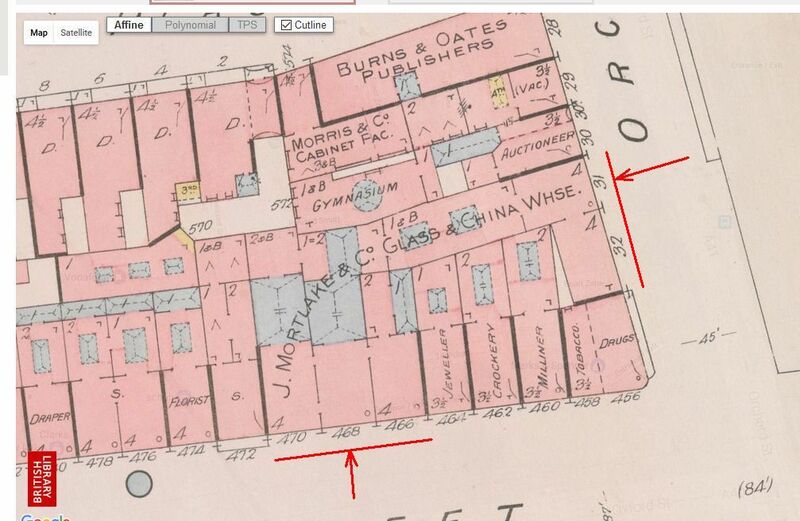 (11) So, Mortlock had been given new numbers and although Brown and Gould were slightly simplistic in calling it just 470, Goad’s insurance map shows that they occupied 466, 468 and 470 Oxford Street, communicating with 31 and 32 Orchard Street. 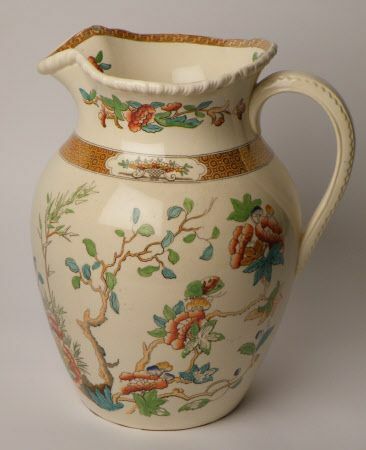 In 1914, John George Mortlock’s private collection of porcelain was auctioned by Christies (catalogue online here) and it did, of course, include some choice examples of their own china, which in some cases showed how “Royal” services did the rounds and were sold twice over. For instance, number 50 in the sale catalogue is described as a dessert service decorated with roses, thistles and shamrock with a lion and crown in red and gold, in dark blue borders gilt with the garter motto. These items were part of a large service manufactured around 1810 for H.R.H. The Duke of Clarence (the later King William IV) who gave it to Lady Augusta Fitzclarence. 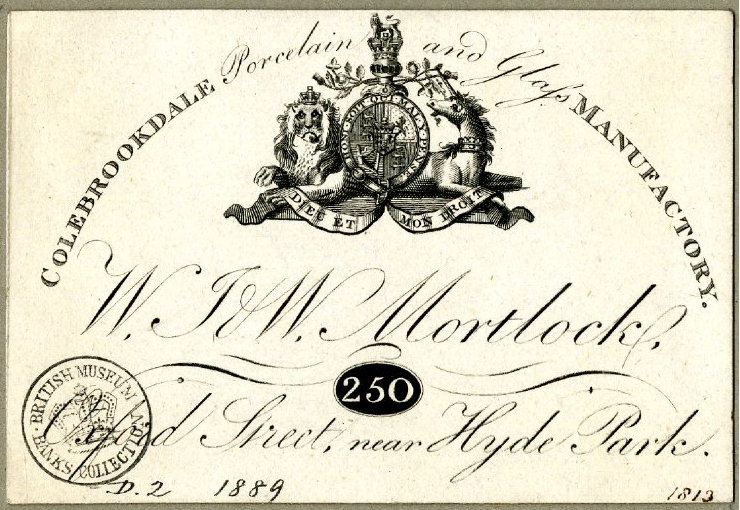 Mortlock ‘repurchased’ it [you wonder why; was the lady short of money?] and then sold a portion of it to the Royal Warrant Holders for presentation to George V on his wedding. I think I found a picture of it in the Royal Collection (see for full description here). There is a slight discrepancy in years as the catalogue dates it to 1810 and the Royal Collection to 1820, but it matches the description in the sale catalogue. 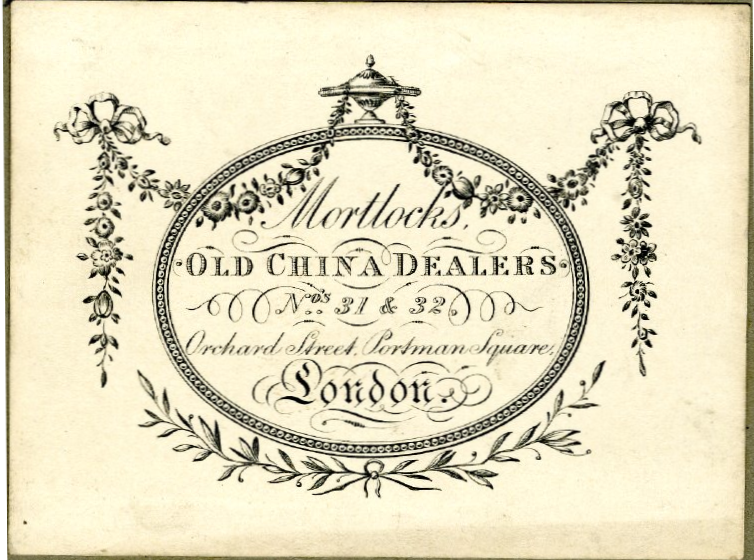 Mortlock & Co. became a Limited Company in 1894 and ceased trading in the 1930s. 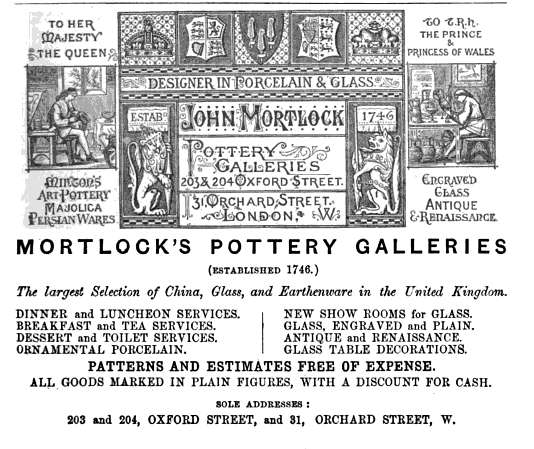 There is far more to be said about Mortlock & Co., for instance that they organised exhibitions of pottery, and that they also had an art studio where they taught people how to decorate china, but I will stop here and refer you to the website on Meldreth History (footnote 1) where you will find all you want to know about the Mortlocks. (1) Information taken from the website on Meldreth History which also contains a family tree (see here), combined with partnership notices in The London Gazette. (2) The London Gazette, 10 January 1809. (3) The London Gazette, 29 March 1831. The notice stated that the partnership had been dissolved on 25 March 1828. (4) The London Gazette 19 May 1835. Simon was the son of Elizabeth Mortlock and John Sturges; Elizabeth was the granddaughter of John Mortlock who was the brother of William I. Elizabeth and Sturges were married in 1812 and Simon was born in 1817. (5) The London Gazette, 9 July 1841. Simon Sturges later became the vicar at Wargrave, Berkshire. (6) Advertisement in The Porcupine, 29 November 1800. (7) Howell G.M. Edwards, Swansea and Nantgarw Porcelains: A Scientific Reappraisal, 2017. (8) West Sussex Record Office, PHA/9212 and PHA/10416. (9) Nottingham University Library, Pw K/4533. (10) The Sunday Times, 11 August 1861. (11) The Times, 10 September 1881.